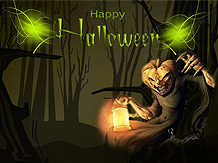 Download the following exquisite screensavers specially prepared for Halloween. They are absolutely free, and the best part is, you can also gift them to your friends by clicking here. Instructions: Click on the download link, and then save the file on your disk. After the file is downloaded, just click on it, and follow the simple instructions to install the screen saver in your machine. 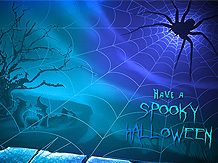 Spice up your desktop with free Halloween theme screensavers. Celebrate Sweet Halloween Day with this spooky witch Halloween musical Screensaver where you can see Witches flying, a haunted house with ghost and bats. 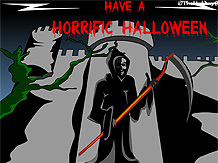 Scary music too, perfect for Halloween and to surprise someone. Those who love horror movies and are not scared of witch or ghost can enjoy this fantastic musical screensaver by downloading it on your desktop. Not for the weak hearted, it will make for a spooky desktop and set the mood. Try this cool Jack-o-Lantern screensaver made especially to mark the occasion of Halloween and bring the spirit of this wonderful and unique holiday right to your computer monitor. Our Favorite! Spice up your desktop with these Spooky Halloween Screensaver which includes skeletons, spider, skulls, and a scary ghost and will set your mood for the occasion. Let your desktop share the scare.